How are you all ? I am soooo sorry for being away for such a long time and not being able to post. I really missed my sweet little space on the world wide web and my lovely readers. Today's post is to let you to be updated about the latest happenings of my life. As you already know ( I believe that you do but if you don't then please check about section to know me more ) that I am settled in Australia after wedding and this was my first trip to India after coming here. I went there during the first trimester of my pregnancy because I really needed my mom. I was soooo sick that I lost nearly 10 kg weight in 2 months despite of being pregnant and got really weak. I stayed with my parents during my pregnancy and delivery and after that also. I had to shop for all of us and attend a few family functions so I also was occupied during all these months. I did some insane online shopping and spent more than $2000 on so many things. I have shared a few things in my shopping hauls so do check those out if you haven't. Then the day finally came when hubby came back to take me and our cupcake back to Australia. We booked our flight with Singapore airlines and it was a pleasant experience as always. It's been around 2 weeks since I am here in my new house at Brisbane, Australia and I haven't even unpacked all my stuff yet because my little munchkin feels so insecure and does not let me leave her and do anything. She is trying to adjust here and I am helping her so that it's not that difficult for her. Very soon you will get to see some exciting makeup looks, helpful product reviews and so much more interesting stuff because I am trying to get back to work and won't take long. 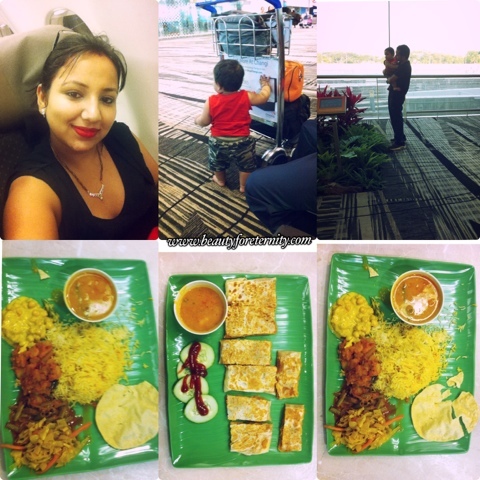 The pictures shared above are from the latest happenings of my life.These were clicked at Changi Airport, Singapore during our stay. I hope you enjoyed watching these pictures and having an insight into my life. What are you all upto ? Do share with me the in the comments below. I would love to know about my lovely people.